Egypt's Defense Minister Says He Will Run For President : The Two-Way Field Marshal Abdel-Fattah el-Sissi says that he's resigned his military post and will run for president in July elections. 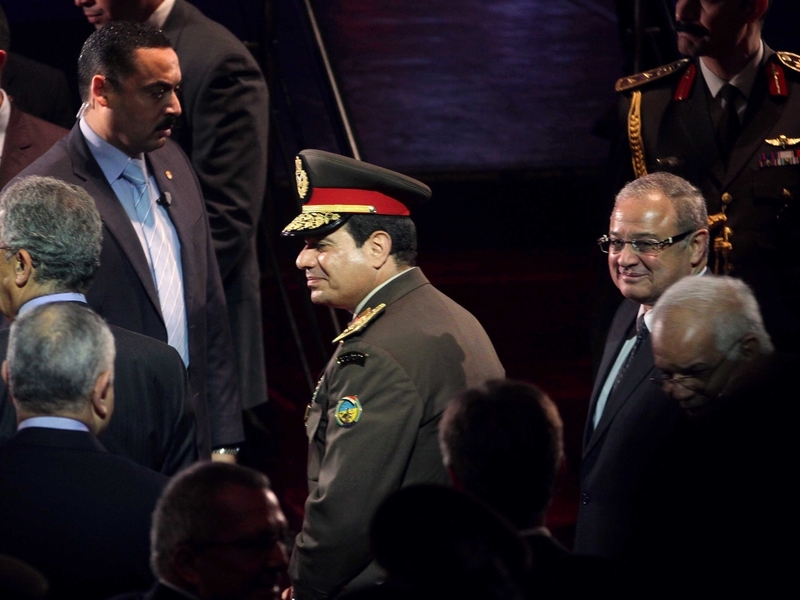 Egypt's defense minister, Field Marshal Abdel-Fattah el-Sissi (center), attends a gala event at the Cairo Opera House earlier this month. The head of the Egyptian military, Field Marshal Abdel-Fattah el-Sissi, says that he has resigned as defense minister and will run for president in elections expected in July. He made the announcement in a nationally televised speech. "Wearing military fatigues, he said it was the last time he would wear it and that "I give up the uniform to defend the nation" and run in elections expected next month. "El-Sissi ... is considered almost certain to win. Under Egyptian law, only civilians can run for president, so his resignation was a required step." As we reported in January, Sissi, 59, had been urged to run for president, and his candidacy looks to symbolize the Egyptian military's move to cement control over the country after the ouster of President Mohammed Morsi and the banning of his political allies in the Muslim Brotherhood. Sissi had been a member of Morsi's government, but when popular protests demanded Morsi step down, the field marshal demanded he resign or risk a coup. The official Al-Ahram newspaper's website reports that Sissi gathered his belongings from the Defense Ministry ahead of a meeting of the Supreme Council of the Armed Forces. "Earlier this month, [Sissi] was quoted by state media as saying he could 'not turn his back on calls by the majority of Egyptians' for him to run for president. "Tens of thousands of his supporters, who see him as a strongman able to stabilise Egypt, have taken to the streets to urge him to stand. "The field marshal's opponents hold him responsible for what human rights groups say are widespread abuses, and fear that he wants a return to authoritarianism, three years after the overthrow of Hosni Mubarak."